Brand new work ready to hang in the booth? Check. Sleeves on the new class samples? Check. Gorgeous new Shibori Chic clothing stitched, discharged, and dyed? Check. 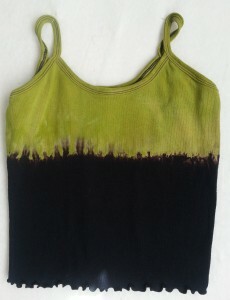 This Shibori Chic camisole was stitched, discharged, and overdyed and is a great project for a 4 hour class. 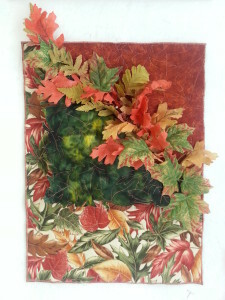 There is lots to do to get ready for the quilt show. I still have to quilt a few small pieces, and tag and package the merchandise, but I am almost ready for the big show this weekend. The quilt show is always so much fun. 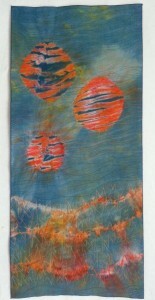 I am so looking forward to hanging out with my friend Patricia Hasting-Sargent and talking to people about my work. Will I see you there? Can’t wait to see what new things you have at the show.